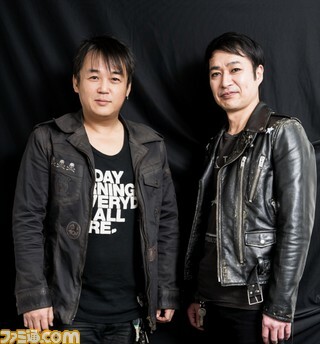 Famitsu published an interview with Kingdom Hearts Series Creator Tetsuya Nomura and Takeharu Ishimoto, composer for Dissidia Final Fantasy NT. During the interview—which was primarily about Dissidia—Nomura confirmed that Takeharu Ishimoto and Tsuyoshi Sekito have also been working on music for Kingdom Hearts 3 alongside series composer Yoko Shimomura. Takeharu Ishimoto and Tsuyoshi Sekito are no strangers to the Kingdom Hearts series. Ishimoto was a Synthesizer Programmer for Kingdom Hearts Chain of Memories and Kingdom Hearts II, and he and Sekito have worked alongside Yoko Shimomura to compose and arrange tracks for both Kingdom Hearts Birth by Sleep and Kingdom Hearts Dream Drop Distance. Among their most memorable contributions are Ishimoto's Enter the Darkness, Enter the Void, Unbreakable Chains and Twister -Kingdom Mix-, and Sekito's Black Powder, Majestic Wings, Wild Blue and Storm Diver. They have also worked on songs for The Grid, Pranksters Paradise and other worlds in the Kingdom Hearts series. —So Nomura-san, do you have any final words for Ishimoto-san? Hello new divisive topic! I've been reading about this here and there, and already people have very different stances upon them. Usually "UNTAMABLE" from DDD is seen as a con, while "Unbreakable Chains" from BbS is seen as a pro, with "Majestic Wings" being kinda in-between. Oh well. Music is possibly the most subjective of the arts. I'm kinda "meh" on the whole thing, frankly while music plays an important part in my gaming experience is really rare that a track I dislike manages to *ruin* it. I never purchased a soundtrack before. I didn't really see the appeal in it. I have been interested in it. Asking the important questions around here. Tbh I'm actually confused if this is sarcasm or not, even though it probably is sarcasm. But anyway, can't wait for Ishimoto to give us the inevitable remix of Enter the Darkness/Unbreakable Chains. Type-0,Crisis Core and the PSP Dissidias have amazing soundtracks so this is fine. Yoko was always going to return. She was even in an interview with Nomura post-world tour but pre-D23 in July last year where Nomura was telling her she has over 700 songs to write and record (a hyperbole, for sure). I do think they are great composers and all, but I am definitely more interested in Shimomura's contributions to the game. I'm assuming she'll still get to do most of the music, which is exactly what I want. I really like Enter the Darkness. The others, not so much. Just give me new Shimomura. Enter the Darkness is one of my favorite villain themes ever. I'm super excited to see more contributions like that one in KHIII! Still, I vastly prefer Yoko's compositions overall, so I really hope she gets to do most of the music in the game, especially World Themes and important Boss Fights. I swear it wasn't, lol. I honestly just didn't know who these two were at all... Listening to the tracks attributed to them in the first post, I like Sekito's work. When I read the opening post, I knew it didn't say anything about Shimomura not returning or anything, but the first thought that entered my head was, "Don't tell me they actually got Utada on board for the final game in this saga and then lost Yoko." As long as their contributions to the soundtrack don't sound too distinct from Shimomura's then I'm absolutely happy for their involvement. The Kingdom Hearts soundtrack is a key part of the franchise identity and I don't want that to be compromised. "There are more songs than before?" This makes me so excited! All I can think about right now is KHIII. I wonder if that is how it will be through this whole year. Probably! I'm so excited!!! 2018!!!!!!! Can't say I'm too surprised about it. Not only has the music side of KH practically been a triumvirate since BBS (of course with Shimomura still having the biggest slice of work), KH III being generally bigger in scope than any entry in the series beforehand already somewhat hints at there being so much to do that Yoko simply cannot do it all alone anymore. "There are more songs than before." I never heard dislike for the track before so I'm a little surprised hearing this. I think it's a fun track. The fact that you havenâ€™t complained about their music in BBS or KH3D should already signal to you how well they work with Shimomura. Ishimotoâ€™s best work from Crisis Core and Type-0 is some of the best game music Iâ€™ve ever heard and fits very well with Shimomura. And his entire library of TWEWY music is what put him on the map for many people. And despite only composing the first time in BBS, both Sekito and Ishimoto have been involved with the series for years as arrangers and music programmers. This is a good start with news for march. I'm happy that he's back for KH3. I'm happy to hear this! This is a monumental project, and Yoko will definitely need collaborators to get it all out in good quality. As much as I love her, this isn't a project for one composer to do. Trust me, one time I did a project where I scored 7 minutes of film music and it still took me 11 hours to do this. Worst yet, that was me rushing the project and I still could have done a lot better. Yoko will need all of the time and help she can get. More songs, and especially a focus for boss music? Good to hear, at least it's somewhat confirmation of them considering many bosses for the game. Wasn't as assured as it might've seemed. Well, I'm the last person to analyze music myself, lacking proper background AND good hearing for this kind of stuff, but this is what I've been gathering. People usually put this specific track as a "cause for concern" to this new piece of information we just got. Apparently they think it's a bit too "whimsical dreamy" and carnival fun. Pretty much what I've seen. A lot of criticism against Sekito has been for the style of his 3D songs rather than the actual composition? But that's just what they chose to go with; it's not like he's only capable of that genre. I know she was on board, but I was under the impression your comment was looking for an update on her contributions. I know as hell I am, her work is too damn good. Ah, so does that mean tracks like "The beginning of the end" and "Vermilion Fire" are also from his library? Those rival "Fate of the unknown" from the KH2 FM secret ending in terms of epicness. Yeah I am happy about this, but also expected it to be case as it has been for the past few games. People complaining about their work in DDD is strange as I think the whimsical feel was for the Dream Eaters, not like they just really wanted to change the direction of the boss music lol. They aren't my favorite boss themes either, but they definitely capture the feeling they wanted to go with, I think. More music tracks than ever makes my mind race lol, I dunno why I didn't consider it before, but is it possible areas of worlds have different overworld and battle themes? Like Olympus in KH2. The only world we have seen so far that I can't see a distinct change in scenery is Monster's Inc. But I know there is more to that world, too. So I could see that happening. It's cool that they're at the point where they are picking music for the big battles (major boss battles). If they can top the music in KH1 finale against Ansem or even the poignant yet epic music for the final battle in KH2 against Xemnas, we're in for something special! I'd love songs similar to "What Becomes of Us?" and "The Price of Freedom". Does anybody know what songs they made in BBS and 3D? We have a handful of tracks listed in the first post. This was great news, especially after hearing Takeharu was going freelance. I'm sure he'll still be involved in Final Fantasy and Kingdom Hearts going forward. I've been pretty indifferent to their contributions up until now, with Vanitas' set of themes being the only real standout between them in my opinion (that Orchestra arrangement is a beast, though). Their tracks are very obviously not!Shimomura when they pop up, which isn't altogether a bad thing, but I hope they're being selective about how and where they're being applied so that the soundtrack still flows. BbS struggles to sound musically cohesive, and DDD is just all over the place. sadly, i'm not a fan of the both. there is something about the melodies that yoko do, they simply can't replicate! i wish the whole album was done by yoko+kaoru+ the guy who done FFxv based on yoko observations. I found that Ishimotoâ€™s stuff in KH3D was his weakest but I have a feeling that his work was a rush job. Sekito has some good and some average tracks. Overall I think a lot of what made KH3D so inconsistent was the fact they used this game to try and experiment with so many things. Kaoru Wada is great at rearranging tracks for Kingdom Hearts but his own style is vastly different from Shimomuraâ€™s. And as much of a legend Wada is, I find that his style is much more suited for television and films because of how he makes his music flow with the story. With the way games break up story and gameplay, you canâ€™t get the same kind of musical flow in them. The person who worked on XVâ€™s music with Shimomura? He also merely rearranged her tracks or created his own. His own music was distinctive imo and you could easily tell when it wasnâ€™t a Shimomura piece despite the album crediting her. Itâ€™s why XVâ€™s OST is so forgettable outside of Shimomuraâ€™s pieces. I agree Sekito and Ishimoto cannot replicate Shimomura at all, but they donâ€™t try to. They arenâ€™t supposed to, either. Speaking of experimentation, wasn't Epic Mickey the hot topic from 2010 - 2013 for Disney games? people often compared it to Kingdom Hearts because both games displayed Disney characters in a darker light. Matter of fact, listen to these two tracks side by side and tell me that there wasn't some sort of Epic Mickey influence with the trumpets in Dream Drop Distance? I donâ€™t think it was inspired by Epic Mickey as much as both were inspired by the music found at the Disney Theme Parks. I agree, and don't get me wrong DDD has some great individual tracks including some of Shimomura's best work, but on the whole it just feels like [strike]as much of a rush job as the rest of the game[/strike] it's strained for clarity. I view KH as belonging as much to Shimomura as it does to Nomura so it's really their complementary visions for the game which I'm interested in. As long as all of the elements fit into that nicely, I'll go with it. Enter the Darkness, Unbreakable Chains, Enter the Void, they all are masterpieces to be honest, Vanitas has such a strong musical representation in the series, in my opinion truly at a main-character-level. Aquaâ€™s theme is a â€œstrongâ€ distinct entry, Roxasâ€™s theme is another strong distinct entry, and Vanitasâ€™s themes are on the same outstanding level. To this day I still wonder how Ishimoto got to compose â€“specificallyâ€“ the themes for Vanitas. Arenâ€™t his other KH tracks mostly field/battle themes, or minigame tracks? And just to mention, if we will get anything techno/electro/sciency from Ishimoto in KH3, Iâ€™ll be on cloud nine. I am soooooo into his TWEWY soundtrack (arenâ€™t we all), and I loved his tracks for The Grid in DDD, I found them by far a lot better than KH2 Space Paranoidâ€™s themes (I still think electronic tunes should be given to someone else than Shimomura, she is a genius of classical compositions, even when adding some modern sounds to it like in some FFXV tracks, but for completely digital/computer-ish worlds, itâ€™s just not gonna be the best thing. Thatâ€™s why choosing Naoshi Mizuta for Episode Prompto was a blessing and delivered excellent music that fits the blonde technophileâ€™s DLC). And just to mention, if we will get anything techno/electro/sciency from Ishimoto in KH3, Iâ€™ll be on cloud nine. I am soooooo into his TWEWY soundtrack (arenâ€™t we all), and I loved his tracks for The Grid in DDD, I found them by far a lot better than KH2 Space Paranoidâ€™s themes (I still think electronic tunes should be given to someone else than Shimomura, she is a genius of classical compositions, even when adding some modern sounds to it like in some FFXV tracks, but for completely digital/computer-ish worlds, itâ€™s just not gonna be the best thing. I'm pretty confident Ishimoto will be lending his talents to the San Fransokyo world themes (and if Wreck it Ralph makes its way in there). I'm sure it'll all sound fantastic. I don't like this news since I'm not a fan of Ishimoto and Sekito. Also, I hope Shimomura don't rush the OST of KH 3 because she only got like 2 years to work on it after FF XV released in November 2016.